This audio book was absolutely wonderful. I found it really inspiring and engaging. I was really surprised by how interesting it was, I was afraid it would be a little dry but that wasn't true at all. I enjoyed every chapter. This book really did make me want to change my life, it gave me a lot to think about that I'm still working with. In fact I hope I never stop thinking about it and the issues it opened up. This book is part autobiography, part history of the the Grameen Bank, and part reflection on microcredit lessons learned and plans for the future. The book was originally publised in 1997 and revised in 1999 and 2003. The early chapters cover the author's childhood in Chittagong, his Fulbright scholarship for a Ph.D. at Vanderbilt and his return to Bangladesh following its war for independence. Bored with government work Yunus quit to run the economics department at Chittagong University, situated in the coutryside where the famine and poverty was impossible to ignore. Following experiments with funding irrigation the author turned his attention to the landless poor who were trapped in a cycle of dependency on local moneylenders. Meeting a bamboo stool maker became a pivotal moment, realizing she needed only 22 cents to escape an exploitative arrangement with a trader, and that forty-two people in the same village could be helped for a total of less than $27. Thus was born Yunus's dream of a bank to help the poor. After months of struggling with orthodox bureaucracies he started a pilot project with the help of students providing one year loans to groups of five borrowers - many of them women - following indoctrination in responsibility and self-reliance. Interest was set at 20%pa with weekly repayments over the course of a year, repayment rates were over 98%. Over the next few years the Grameen Bank expanded into neighboring villages and districts gaining members and managers, and support of first the Central Bank of Bangladesh, and then international institutions including the Ford Foundation. In the 1980s and 1990s the bank expanded rapidly across the country, loaning to over two million members and diversifying into loans for shelters, fisheries, exports and telecommunications. The author is particularly proud that the Bank is now fully independent, owned by its members, and profitable despite the frequent natural catastrophes that afflict Bangladesh. The bank has become a poster child for social entrepreneurship, bypassing government and seeking to eliminate poverty in Bangladesh through its self help principles while making a modest profit. As such it offers a new vision of capitalism, subject to the dicipline of assigning resources efficiently, but without seeking to maximize profits at the expense of everything else. Founded in Bangladesh by Muhammad Yunus in 1976, the Grameen Bank is one of the most successful attempts ever to employ capitalist principles to achieve social goals. By approaching poverty from a different tact, Grameen seeks to reconcile the inequalities inherent in capitalism by mobilizing the "informal sector" of society-the self-employed poor. By addressing the root cause of poverty (i.e. lack of access to capital) Yunus has succeeded where many others have failed. Often, well-intentioned governments fail to solve the issue of poverty because of "misguided development" policies and bloated bureaucracies. Similarly, many international financial institutions, such as the World Bank, have failed because their heavy-handed top-down approach excludes those most in need of aid. Yunus writes, "I have always believed that the elimination of poverty from the world is a matter of will" (248). Grameen succeeds where others fail because they appeal to the most downtrodden, the poorest of the poor-the bottom 50% of those already below the poverty line. A precocious child and avid reader-especially of comicbooks-Yunus was one of fourteen children born to devout Muslim parents. The family lived on the second floor located above the jewelry store that his father owned and operated in Chittagong, the largest port-city in Bangladesh. His mother, despite her later mental illness, instilled a sense of charity early on in her son that would last a lifetime. While the seeds of the Grameen Bank were planted when Yunus was a child, they were certainly nurtured while studying under the tutelage of professor Nicholas Georgescu-Roegen in America. Yunus left to attend Vanderbilt University as a Fulbright scholar in 1965 after opening a successful packaging business in Bangladesh. The professor encouraged Yunus to question traditional economic theory, and to adopt a more pragmatic and social perspective. These influences resurfaced when Yunus returned to Bangladesh in 1972 to chair the economics department at Chittagong University. Yunus experienced an epiphany one day while lecturing to his students. Amidst his moribund surroundings, Yunus became compelled to confront the obvious incongruence between the high theory he was espousing and the omnipresent reality of daily-life, "What good were all my complex theories when people were dying of starvation on the sidewalks and porches across from my lecture hall? Nothing in the economic theories I taught reflected the life around me" (viii). Yunus at once realized that he had an obligation as both a Bengali and a college professor to help alleviate the rampant starvation that wracked Bangladesh at the time. "But if you go out into the real world, you cannot miss seeing that the poor are poor not because they are untrained or illiterate but because they cannot retain the returns of their labor. They have no control over capital, and it is the ability to control capital that gives people the power to rise out of poverty (141)." The limited access to capital kept the poorest of the poor enslaved to usurious rates charged by moneylenders whose strict terms affected the ability of the poor to ever repay. However, the very fact that the poor had managed somehow to survive is proof-positive that they too could become successful entrepreneurs if given the opportunity. With access to capital the poor can compete and retain control over profits. In fulfilling its promise to raise the rural poor out of poverty Grameen has expanded its original income-generating loans to now include housing and education loans. The interest rates for each of the aforementioned loans are calculated based on simple interest and are 20%, 8%, and 5%, respectively. Proof of the strength of the Grameen project lies in its 98% recovery rate. Yunus attributes this success to making 95% of its loans to women. He believes that women are more likely to share the benefits of the opportunity with their family than are men. Unfortunately, this approach continues to meet strong opposition from conservative forces that view Grameen as a threat to their religious and traditional values. Nonetheless, the passion and commitment shared by villagers over the opportunity offered by Grameen eventually overcomes all local resistance. "This is the beginning for almost every Grameen borrower. All her life she has been told that she is no good, that she brings only misery to her family, and that they cannot afford to pay her dowry. Many times she hears her mother or her father tell her she should have been killed at birth, aborted, or starved. But today, for the first time in her life, an institution has trusted her with a great sum of money. She promises that she will never let down the institution or herself. She will struggle to make sure that every penny is paid back (65)." Despite all the good accomplished by Grameen, its micro-credit program represents only one element of a multi-pronged strategy needed to one day eradicate poverty from the surface of the earth, relegating it once and for all as an artifact of an unenlightened past. Yunus envisions a more comprehensive program that would expand the notion of economic development to include "improving the general standard of living, reducing poverty, creating dignified employment opportunities, and reducing inequality" (72). He argues that the goal of such development should be measured by a new set of objective criteria, such as the "per capita income of the bottom 50% of the population" (146). The efforts of Grameen and others committed to fighting poverty culminated in the first ever "Micro-credit Summit of 1997" co-chaired by Hillary Clinton. Yunus believes that future success will require a new breed of "social entrepreneurs" who are driven by social goals rather than maximizing profit. The Grameen Bank's success has created an abundance of opportunities for social entrepreneurs to serve the needs of this emerging market. Mohammed Yunus, the primary author of this book was catapulted into world fame after the Nobel Peace Prize in 2006.This book by him was written in 1998, a good many years before the Nobel recognition. By that time, his project plan had matured significantly and served as a pilot case for small loans in several other countries, distributed over all the continents of the world. In this book, Mohammed Yunus talks of his life in the context of the microcredit programme in an intimate, no-holds-barred autobiography. He begins with his childhood as one of twelve siblings in small town Chittagong before independence, goes on to his life as a Fulbright student in the USA, at the end of which, he lobbied actively for the independence of his home country from the clutches of the then West Pakistan. He then recounts his return to Bangladesh and taking up a professorship at the University of Chittagong. Somehow the academic status and lifestyle did not satisfy the young professor. He wanted to reach out to a wider clientele, to put his knowledge to practice in helping others improve their standard of living. So he started going out to the nearby village settlements and interact with the people on a one-to-one basis in order to find out what they needed and ho he could help them.How this seemingly small step led to the establishment of micro-credit and the Grameen bank as a viable means of global financial interaction is the subject of this book. The journey was not easy. The author was confronted with an incredible amount of resistance at every stage.The author, however, was no fool and his first steps wer cautious and discreet in the extreme. The first spurt of activity was triggered by the famine of 1974, when he took on the daunting task of helping farmers grow a higher yielding variety of rice. This was done, without the benefit of any agronomical background. The above illustrates the lengths the author went to abandon traditional learning methods, taught in University environs. By late 1975, he was "conceptualizing many CURDP programmes including a mass literacy project. I encouraged my students to go down with me into the village and see how day-to-day life could be improved. They could choose a topic and write a research paper for a course credit." In later sections of the book, the author discusses how the microcredit scheme have worked in different countries. In particular, he elaborates on how microdredit cannot work in developed countries where social welfare is predominant. He attributes the failure to the connection between state sponsored benefit and state required guarantees, showing how these can severely limit the choice available to the citizen living on welfare. The author is also against the mega funding agencies such as the World Bank. He has refused help from them on more than one occasion, preferring to stick to his own independent assets, even so under pressure from his own country's government. All in all, this book is a riveting read and would grace any bookshelf by its presence. Banker to the Poor, is by written Nobel peace prize reciepent, Muhammad Yunus. As a professor in Bangladesh, Yunus, with just twenty-seven dollars of his own money, was the "mid-wife" to micro-lending movement. He parlayed his success into remarkable achievements which have bettered the lives of millions. It wasn't always easy, and his telling of the story, is inspirational, if somewhat repetitive. You can easily imagine the tears of joy of villagers, who with micro-lending, are able to rise above mere substience living. He makes the case that much misery is alleviated when micro-lending is available to the poor in the Third World. While Yunus does not say so directly it is easy to extrapolate, that poor people leading better lives do not take up violence. America would be a lot more secure if it took a few millions from "military assistance" and instead invested it in micro-lending. However, Yunus claims, "everyone" benefits when trade barriers are dropped. Trade barriers have largely been lifted in the apparel industry Consequently, the textile industry in the US employs a mere fraction of workers than it used to. Guess "everyone" doesn't include the tens of thousands of former American texitle workers. There must be a way, to support the developement of the Third World, without America losing jobs. While Yunus doesn't answer that question, he does have a lot of answers. A five-star book. I can only agree with the other reviews of this book, but I would like to add that anyone who appreciates what Yunus has done might also read 'The Mystery of Capitalism' by Hernando de Soto. Both de Soto and Yunus underline the importance of using market-based mechanisms to alleviate poverty at the grass-roots level (de Soto suggests giving squatters and illegal workers legal title to the land they occupy and the goods they have so they can use them as collateral to raise capital and receive infrastructure). P.J. O'Rourke makes the same point in several places, but he is writing from a quasi-comedic point of view. There is a reason these ideas rated a Nobel Peace prize, and reading about the thoughts and ideas in the firsst person is more powerful than others' interpretations. Should be title "How I succeeded as banker to the poor"
There is no doubt that the author seems to have done a lot of hopeless people a great service. However, this book really struck me as being more about him, why he is so amazing, and how he repeatedly overcame odds dealing with short-sighted, ignorant, selfish bankers doing things the traditional way. The book would have appealed to me a lot more if he had gone further in explaining why traditional methods failed but were maintained. Also, there was very little frank discussion of the strengths and weaknesses of microfinance. Sounds like maybe I should have read the Wilson Quarterly article instead. The book was a repetitive sales pitch and could have been a lot more. Muhammad Yunus believed that every human being had a basic right to credit. He believed in the human spirit and peoples' hard work and honesty when given a chance to sustain themselves above poverty. His accomplishments have proven his theory over and over in several countries to millions of people. Micro-lending will surely be a part of the future success in Africa, Asia, and South America. A modified form of Mr. Yunus' model has worked in the USA, unfortunately, we as Americans aren't schooled nor molded to be basic entrepreneurs. We must change our school systems from teaching how to become good employees to how to become entrepreneurs as well. Mr. Yunus' model includes 5 person groups to help each other and support each other when one gets behind in loan repayments and/or family crisis. This is a very important requirement to micro-lending and must not be excluded when trying to duplicate the success of the Grameen Bank. Ever sat with a Nobel Prize winner? Ever had a conversation with a saint? Reading Muhammad Yunus' book, Banker to the Poor, is as close to that as you need to open your eyes to the possibility of a world where poverty is history. This man presents his extraordinary accomplishments and contribution in such a humble, first-person, and, straightforward manner that you cannot help but be moved to think about what each of us can do to make the world we live in a better place. Truly an inspiration! The first fifth of the book tells the story of his youth growing up in the turbulent period bridging World War II, Indian independence, Pakistani independence and finally the Bengali struggle for independence from Pakistan. Yunus finds himself a U.S. educated economist back in his homeland to teach university when famine hits the country and shakes his faith in traditional economics. He seeks out to tackle understanding the problem of poverty, from the perspective of the poor rather than looking down form the Ivory Tower or down a Social Darwinist nose. What he finds is not a lack of skills, motivation and human ingenuity but rather a lack of access to capital and credit - essentially a failure of the market, rather than a failing on the part of its victims. Yunus goes about conducting an experiment, lending $27 from his own pocket to 42 villagers for various small-scale ventures and cottage industries. His efforts bear fruit and snowball from there, microcredit is born. The story from then on is about how he single-mindedly and judiciously builds on the early successes and incorporates a philosophy of empowerment and deferring to the skills of his staff and especially his clients. Among the poorest of the poor, Yunus finds an incredible fountainhead of innovation and motivation whereby people, if given the chance, pull themselves up by their bootstraps. Many of Yunus' approaches break with tradition and taboo, for example, lending primarily to women, though he is Muslim and operating in a traditional rural context. Likewise, his philosophy and politics do not fit neatly in the typical Left and Right framework - he seems above the divide and willing to borrow or discover what works without regard to ideological boundaries - bearing flak from the Leftist rebels and derision from the banking establishment. I had wanted to read this book for awhile and when I finally got to it I was not disappointed. Yunus tells a captivating story that pulls the reader in. While the tone of the book is outspoken, Yunus can back up his tone with real results and a compelling vision for the future of social entrepreneurship and a world without extreme poverty. He comes down pretty hard on well meaning but ineffective organizations and individuals that are out of touch with the poorest of the poor that he works with. Throughout the book, Yunus shows the depth of his trust in the poor to work for themselves and better their lives without charity. One of the most inspiring books I've ever read, and certainly the most eye-openning about how REAL change can be made in the world, on the grand scale--and not through the way that I would think change such as ending world poverty, could come about (through philanthropists, donations, taking care of the poor's needs for them)...but instead through a radically new economic/business model, that simply replaces "doing good" with "making profit" in the traditional capitalist way. A well written book about how Yunus successfully lent money to impoverished people in Bangladesh and, in so doing, empowered them to create better lives for themselves. The pages echo Yunus's faith in the human spirit, his dedication to eradicating poverty, and his tenacity to succeed in the face of naysayers cries. He talks about the origins of the banks name, The Grameen Bank and notes that Grameen derives from the word gram, or village. One of the more fascinating life histories I've read in a long time, Muhammad Yunus' autobiography enlightens more than entertains. And what enlightenment! Born in 1940 in British-ruled India, Yunus recounts India's and his native East Pakistan's independence through the eyes of the seven-year-old he was. Replete with juvenile impressions of contemporary political and religious prejudices with their accompanying tensions, Yunus' account of independence and partition of the Indian subcontinent opened my eyes to a much different view of that history than I had ever read in adult-centric volumes. The watershed event for Muhammad Yunus was Bangladesh's 1974 famine that killed thousands. As a faculty member of Chittagong University, he petitioned government to wake up and do something. Instead of waiting for a bureaucracy to emerge, though, he began to organize farming projects and sought other ways to alleviate suffering. By 1976, Yunus had stumbled onto micro-lending. Realizing that local stool makers were not much more than slave laborers due their complete and total dependence on wholesalers for both daily credit for raw materials and a monopolistic market over which they had no price control, Yunus broke the cycle by lending 42 stoolmakers the total equivalent of US$27 from his own pocket. From those unplanned and humble beginnings, the Grameen Bank was founded by an economics professor who had no intention of becoming a banker-much less a banker to the poor. Today, Grameen Bank ("grameen" is an adjective meaning "village" or "rural" in the Bangla language) serves over two million micro-borrowers in nearly 40,000 Bangladeshi villages. It leads the way as a model for similar micro-lending movements in dozens of other countries, including the United States. Muhammad Yunus constructed a system in Bangladesh to help the poorest of the poor get loans for tiny amounts of money. Since its inception 1980, variations on this system have spread all over the world with great success. Yunus starts with the premise that credit should be a right, not a privilege, and the people who need credit the most are the ones locked out of the standard credit system. He recounts a story of a woman who makes bamboo stools. She borrows money to buy the raw materials from a middleman, and as repayment for that loan, she is forced to give the finished stool back to him. He then pays her 2 cents for her work. The raw materials cost only 22 cents, and if she just had that capital herself, she could buy her own bamboo and reap all of the profits from the final sale of the stool. But she doesn't have 22 cents and therefore is effectively a debt slave. Most people who hear about the concept of microfinance for the poor immediately ask, "Why do poor people pay the loans back?" The answer provided in "Banker to the Poor" is multi-faceted and not wholly satisfying, but it is clear that the system does work. Repayment rates are generally higher than loans given to the so-called credit worthy in standard loan arrangements. A rate of over 98% has been achieved. Repayment is encouraged by a combination of (1) a high level of interaction between bank workers and the borrower's communities, (2) fair and respectful treatment by the bank, (3) the formation local peer groups to encourage repayment, (4) short loan terms with weekly payments, (5) loans primarily to women, and (6) the fact that the borrowers know this is their one shot -- if they shirk repayment, they are screwed. Their *lives* are their collateral. Inspiring for anyone who wants to help others. This story is really about courage and strength of conviction. Dr. Yunus showed his courage when he stood up with his peers and helped create the state of Bangladesh. After that, he returned to his country rather than stay in the USA in an easy safe place. That move put him in the middle of the poverty and starvation of his country, and he again showed the strength of his convictions by facing down the beaurocrats and rich classes to begin changing lives. The reason he succeeded is because he used the realism of economics and a reasoned approach. No dreamer, he knew that (as global economics has proven) if people were given access to a free market, and supported in their efforst, they could rise above poverty. I've given my first two copies away, and bought a third. Maybe I can read this one before I give it away!! Read his story and be inspired. In the 1970s Professor Mohammed Yunus had a great idea on how to help the poor of Bangladesh and he made it work. He invented micro-credit, or lending very small amounts to the poorest of the poor, without asking for collateral. This, rather than simple handouts, would help the poor become self-reliant enough so that they could lift themselves out of poverty. He concentrated on women. He relied on peer support to motivate repayment of the loans by making loans to one member of a group of women who would have access to credit only if the entire group had a good credit record (when a group started, they were assumed to have good credit). Professor Yunus's organization, the Grameen Bank, is a cooperative owned mostly by its members and boasts a repayment rate over 98%. In the 30 years since Professor Yunus's first loan of 27 dollars, Grameen has now lent out billions to millions. It has liberated women in small villages, it has brought capitalist market mechanisms to the economic bottom 2% of the world population. Dr. Yunus in this book chronicles the hurdles that he and the workers of the Grameen bank had to overcome. The book is a very good explanation of the economic model that he created to help the poor of his country Bangladesh. Their is a wonderful critique of the economic models that the World Bank and many other like organizations use. The greatest part of the whole story is that the facts of the Grameen bank prove Dr. Yunus's economic model. It also shows that his model is more efficient than the mainstream models that are out there. Everyone needs to read this book, it not only provides a solution to world poverty, but it also provides a framework for one's own community to increase its economic prosperity. All this has been done without any kind of welfare type program. Dr. Yunus's idea that the government needs to promote a system where volunteer can be awarded high honors for their work is a wonderful idea. This book is timeless in its content and most espescially in regard to Dr. Yunus winning the Nobel Peace Prize this year (2006) and Grameen's announcement of their open source software Mifos initiative. Anyone who wants to truly understand how micro-lending can be a powerful tool to battle poverty must read this book. It will inspire you to do more! I have seen Dr. Yanus speak on the topic of Micro-Lending in person, at a consortium in Los Angeles. I was interested and inspired by both the man himself, as well as his ideas. I think that both he, and his workers at Grameen are deserving of the Nobel Prize for Peace. The book is told in his own words and the reader is exposed to both his humility as well as his fierce passion as an advocate for the poor. I found the book both readable and informative. Very good until he went to far. Muhammad Yunus was born in 1940, the third of fourteen children, to an extremely devout Muslim family in Chittagong, the largest port city in Bangladesh. After studies at Chittagong University, and then University of Colorado and Vanderbilt (where he earned his PhD in economics), Yunus returned to help nation-build in Bangladesh, which had declared its independence from Pakistan in 1971. The independence movement had taken its toll; three million people were dead and 10 million were refugees. In 1974, a famine struck. As he tried to alleviate the broad and deep poverty in his homeland, Yunus came to "dread" his economics lectures. They were tragically far removed from the everyday lives of normal people. In a theme that would characterize much of the rest of his life, Yunus almost completely abandoned classical book learning in favor of listening to and learning directly from the extreme poor -- the millions of Bangladeshis living off two cents a day. In 1976 he loaned $27 to 42 villagers, and thus was born what eventually became the Grameen Bank (grameen means rural). As of the publication of this revised autobiography in 2003, Grameen and its many replicants had made $3.8 billion of micro-loans to 2.4 million families in over 100 countries. The borrowers themselves own 93% of the bank equity, 95% of the loan recipients are women, and the repayment rate on the loans is 98%. For all that, in 2006 Yunus and Grameen won the Nobel Peace Prize (not to mention more than two dozen honorary doctorates). If you are interested in microfinance, this book is a prerequisite. Dr. Yunus gives a historical account of the rise of micro-credit and the Grameen Bank. Of course, he is also the biggest advocate of the program. Therefore, most of his arguments are pro-expansion of micro-credit. In spite of this, he manages to show a clear and compelling picture of the micro-finance industry. But, make sure you balance the information with other microfinance books that does not proselytize as much. A good example is "Beyond Micro-Credit" by Thomas Fisher. This book is a testament to the good one can do to millions of people! Poverty belongs in museums! One day, thanks to humanitarians like Muhammad Yunus, poverty will be something of the past and totally extinct, and the next generation will wonder how poverty was ever allowed to exist within our midst. Indeed that will be a glorious day! Professor Yunus recounts his early life living in India, Bangladesh, and then in the United States. He was born in 1940 in British-ruled India. He was one of fourteen children born to devout Muslim parents. His mother was often ill, but despite this, his father never left her. Yunus later obtained a scholarship to study in the States, earned a Ph.D. in economics at Vanderbilt University, and later became a professor. He once commented to his students, "What good were all my complex theories when people were dying of starvation on the sidewalks and porches across from my lecture hall? Nothing in the economic theories I taught reflected the life around me." As a young man he was very involved in the independence of Bangladesh when hundreds of thousands died, and many more after Bangladesh declared itself independent. The country was devastated, and stripped of its natural resources. Professor Yunus quickly left the US and headed to Bangladesh in order to help create a government, and thus get international help and support. He was very concerned about the poor, and decided to help them. He was surprised why banks did not lend them money. Also the majority of the poor couldn't write or read, so they couldn't even fill out the forms required by banks in order to obtain a loan. Grameen Bank (The name means the "bank of the village") was thus started in 1976 as an experimental project to combat rural poverty by providing credit to the very poor. Professor Yunus loaned $27 from his own pocket to forty-two stool makers living in a tiny village. These women only needed enough credit to purchase the raw materials for their trade. Yunus's small loan helped them break the cycle of poverty for good. Throughout the book you'll read of many such success stories. Professor Yunus faced a lot of obstacles in creating his bank. He was accused by the Muslim clergy (Mullahs) of wanting to destroy Islamic traditions, and of promoting Christian values in Bangladesh. Some of his staff were even threatened. This was due to the fact that the bank encourages women to take loans and work, something of a taboo and highly unacceptable to Muslim women living in Bangladesh. In fact, many women were beaten by their husbands for the mere mention of money, let alone taking a loan. Women were also not encouraged to receive an education or work. Professor Yunus says, "All her life she has been told that she is no good, that she brings only misery to her family, and that they cannot afford to pay her dowry. Many times she hears her mother or her father tell her she should have been killed at birth, aborted, or starved. But today, for the first time in her life, an institution has trusted her with a great sum of money. She promises that she will never let down the institution or herself. She will struggle to make sure that every penny is paid back (65)." In 1983 Grameen Bank (GB) was officially established. It is unique in that it has reversed conventional banking practices by removing the need for collateral and created a banking system based on mutual trust. It promotes credit as a human right. Its mission is to help the poor families to help themselves to overcome poverty by issuing them with microcredits (very small amounts, like $7, something a conventional bank would never do). It is offered for creating self-employment for income-generating activities and housing, as opposed to consumption. It is particularly targeted towards poor women. It provides service at the door-step of the poor based on the principle that the people should not go to the bank; the bank should go to the people. This principal is helpful in a Muslim society where women are not allowed to leave their homes without the approval of their husband, and are not allowed to speak with men. In order to obtain loans a borrower must join a group of borrowers, with each borrower recommending another. If one member of the group defaults on payment of his loan, then the whole group is denied further loans! However, to encourage destitute members to join, he/she does not have to belong to a group, no saving is necessary, no weekly repayment is necessary, his/her loan terms are decided by him/her, in consultation with his/her mentor. 1. The family lives in a house worth at least Tk. 25,000 (twenty five thousand) or a house with a tin roof, and each member of the family is able to sleep on bed instead of on the floor. 2. Family members drink pure water. 3. All children in the family over six years of age go to school or have finished primary school. 4. Minimum weekly loan installment of the borrower is Tk. 200 or more. 5. Family uses sanitary latrine. 6. Family has adequate clothing for everyday use and for winter, and mosquito-nets. 7. Family has sources of additional income, such as a vegetable garden, so that they are able to fall back on these sources of income when they need additional money. 8. The borrower maintains an average annual balance of Tk. 5,000 in his/her savings accounts. 9. Family has three square meals a day throughout the year. No member of the family goes hungry any time of the year. 10. If any member of the family falls ill, family can afford to take all necessary steps to seek adequate healthcare. Professor Yunus distrusted dealing with the World Bank. According to professor Yunus, the world bank, with its headquarters away from Bangladesh, does not see poverty, but relies on theories. He also was wary of how they took full control of a country's financial needs. There were a number of major natural disasters in Bangladesh. The 1998 flood was the worst of all. Half of the country was under flood-water for ten long weeks. Grameen borrowers lost most of their possessions including their houses because of the flood. Soon borrowers started to feel the burden of accumulated loans. They found the new installment sizes exceeded their capacity to repay. Grameen Bank repayment started to show quick decline. This was a good opportunity to design a new Grameen methodology, incorporating all the lessons learnt. As a result, Grameen Bank II was created. The bank believes that the poor always pay back their loans, unlike the very rich. On some occasions they may take longer time to pay back than it was originally stipulated. Many things can go wrong for a poor person during the loan period. According to professor Yunus, since the borrower is paying additional interest for the extra time, where is the problem? Grameen Bank has introduced higher education loans for all students who can enter into the higher educational institutions (medical, engineering, etc). Students are made responsible to repay the loans when they start earning. Half the scholarships are reserved for girl students. The remaining 50 per cent is open for both boys and girls. Each year Grameen Bank gives out 3,704 scholarships. Grameen believes that poverty is not created by the poor; it is created by the institutions and policies which surround them. In order to eliminate poverty, all we need to do is to make appropriate changes in the institutions and policies, and/or create new ones. Muhammad Yunus and his Grameen Bank of Bangladesh won the 2006 Nobel Peace Prize. As of May, 2007, Grameen Bank had 7.21 million borrowers, 97 percent of whom are women. With 2431 branches, it provides services in 78,659 villages, covering more than 94 percent of the total villages in Bangladesh. About 3 billion people live on less than $1 per day. Professor Yunus' vision is of eliminating poverty by 2050. This is really a fascinating book and I highly recommend it. 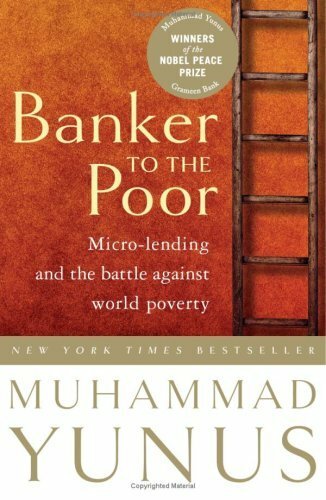 On a recent flight, I read an outstanding book called Banker to the Poor Microlending and the Battle Against World Poverty by Muhammad Yunus. Muhammad taught economics at the University of Bangladesh and saw the poverty around him and felt that that his theoretical work at the university was not solving the problem. What he saw was the small amounts of money loaned to people to allow them to start their business or raw materials could have a huge impact. He started Grameen Bank and started making micro-credit loans to people in groups using the social pressure to make sure everyone repays their loans. His first loans he saw that 42 people needed $27.00 to buy raw materials and this was his first loan. He had tremendous success repaying the loans and has since grown to almost 2,000 branches and a staff of 11,000 which has loaned $3.9 billion with a recovery rate of 98%. Impressive results with limited resources. Mohammad Yunus story is truly inspiring. Makes you question the rules of capitalism. Writing style makes it very interesting to read. Not wanting to repeat the accolades mentioned in the reviews posted I would like to instead share how reading this book and meeting Yunus was a catalyst to some actions I took both on a personal and professional level. The intent is not self promotion or to showcase my efforts. Instead, I am providing ideas and addressing those of you who may find, as I did, that after finishing the last page you are left with a desire to do something. The dilemma was what could I do ......I am not a bank or live in a developing country. I did give copies of the book to friends, colleagues and family but I wanted to do something more concrete. Well, with micro finance "on my radar" I took some actions both on a personal and professional level that I hope are making a difference and are in some ways increasing the visibility and awareness of micro financing. First a little background and comments on the book.....I had the great honor of meeting Muhammad Yunus shortly after he received the Nobel Peace prize in 2006 at an event in Paris sponsored by Planet Finance. Yunus is truly an inspirational person, charismatic in a subtle way, who has touched the lives of many. His enthusiasm is contagious. The book Banker to the Poor is a fascinating read.... humorous, touching and informational as it traces the evolution of the micro finance model from concept (starting with Yunus lending the equivalent of $27 to stool makers) to what it is today with over 7.2 million clients. What resonates with me is the idea of lending versus aid dumps from the World Bank, UN, NGO's and charity organizations. I don't want to discount the millions given as direct charity to the needy but the concept of micro finance creates a sense of pride and responsibility not to mention innovation and creativity. Micro finance can also generate incremental improvement versus charity or outright donations which, in many cases dries up, is short term and results in dependence instead of empowerment. *	I became aware of KIVA (www.kiva.org) an organization that facilitates micro loans (as little as $25) from individuals like you and I to a specific entrepreneur in a developing world empowering them to lift themselves out of poverty. These individuals are in fact showcased on the site where you can see a picture and read about the entrepreneur you have chosen. KIVA is founded by an impressive team of "Social Entrepreneurs". Using technology, KIVA brings the lenders and borrowers together and provides an online community for lenders who are also showcased on the site. Involving my daughter (10) in the decision process we are lending to an entrepreneur in Samoa, so she can buy timber to improve her greenhouse for her flower business. *	As President of my alumni association (Thunderbird) I organized an event around Micro Financing with the Managing Director of Planet Rating, a microfinance rating agency, as a guest speaker. *	At a university in Paris I run a project based course involving teams of MBA students. Proposing a project related to micro finance the students were enthusiastic and completed a study on micro finance in Europe. *	Professionally, I work with individuals in career transition and entrepreneurs in helping them to identify their unique strengths and values and message their brand appropriately both online and offline. Fundamentally, I find that people have a social conscious and want to do something concrete. To this end I suggest lending to a KIVA entrepreneur as a way to concretely incorporate a social conscious into their brand. *	As part of my involvement in a Global Telesummit entitled a Brand You World www.personalbrandingsummit.com I am involved in raising $100,000 in loans for KIVA entrepreneurs in the developing world. Incidentally, Kiva was featured on Oprah and is mentioned in Clinton's book "Giving". Having shared how I was inspired by reading this book I would be more then interested in hearing how it inspired you and what actions you took. There's no question that in most of the world, poor people are left out of the money cycle. Since the really poor don't have anything of value (the thinking goes), how can we trust them with anything? Why loan them money? How on earth would they pay? We'd be foolish to believe they would. Also, what would a person with no means actually do with a loan? They certainly don't need that kind of money. Mohammad Yunus and his creation, the Grameen (Village) Bank, contradict this traditional banker thinking. This book gives a history of Professor Yunus himself and tells the story of how he came to create and grow the bank that eventually won a Nobel Prize for its microcredit programs aimed at exceptionally poor people, especially women. I found the early chapters, about Yunus' personal life growing up in eastern Pakistan, his time in the US, and his return to a newly formed Bangladesh interesting. They provide an appropriate background for his later work in the village near the university where he taught economics, beginning with the first loan he made himself - $27 to 42 people! I found it quite an easy read, although it is outside my own field of expertise. I appreciated the pace up to the last couple of chapters, which seemed to come bowling at me with enormous speed (though maybe that's on purpose given the organization's seeming explosive growth in the 1990s and beyond). I would have been interested to also read about how a typical loan actually gets used and repaid - it's difficult for me to imagine what a borrower's balance sheet might look like that she would be able to put the full amount to work immediately and still be able to make a payment in 1 week. How much return would you really see on a goat or whatever in the first week? I just don't know. I also found myself questioning the seeming need for loan after loan after loan - I'm not convinced that this is completely a good thing, but it wasn't dealt with at much length in the book so I don't know how typical that is or what it really indicates. The last chapter, dealing with the future of the bank and Yunus' desire for a parallel economic system based not on profit but on social progress seemed a little weird to me, but I'm not an economist. It seems like more trouble to re-invent the wheel than to put the car we already have on another path. One thing I found especially compelling is Yunus' development of specific measurable outcomes and goals for his bank's members. The bank's Decisions are interesting in that they seem to have been agreed on by the members themselves, not driven from above. I also appreciated his list of indicators to assess poverty level - although this was somewhat glossed over in the text, these measurable outcomes are applicable to any on-the-ground assessment of functional poverty or non-poverty. If this was the only thing in there, it would still be worthwhile. Read this book. Whether you agree wholeheartedly, scoff openly, or something in between, you'll find it thought provoking.